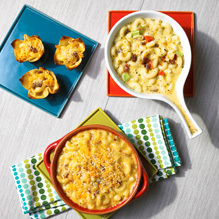 California Smoked Mozzarella cheese and sun-dried tomatoes take macaroni and cheese to a whole new level! Serve as is, or turn this recipe into soup or a bite-size appetizer. Preheat oven to 400°F and lightly butter 4 individual baking dishes with 1/2 tablespoon butter. Melt remaining butter over medium heat in a large saucepan. Add flour and cook for 2 minutes stirring constantly. Whisk in milk and bring to a simmer, stirring frequently; stir in mustard, salt and basil. Add 1 cup Cheddar cheese and the mozzarella cheese a little at a time, cooking and stirring until melted; stir in cooked macaroni and tomatoes and cook for 5 minutes more. Stir together bread crumbs and remaining cheese and sprinkle over top. Cook for 10 minutes or bubbly and lightly browned on top. Press 24 won ton wrappers into 24 lightly greased mini muffin cups, pressing firmly so that the cups are flat on the bottom. Spoon macaroni mixture into won ton cups. Sprinkle with breadcrumb mixture and bake for 10 minutes, tenting with foil after 5 minutes. Melt 1 tablespoons butter in a large saucepan over medium heat. Add 1/2 cup each: 1/4-inch diced onion, celery and carrots and cook for 10 minutes. Add 2 cups vegetable or chicken broth and cook for 10 minutes more. Stir into prepared macaroni and cheese and cook until very hot. Sprinkle each serving with breadcrumb mixture, if desired.